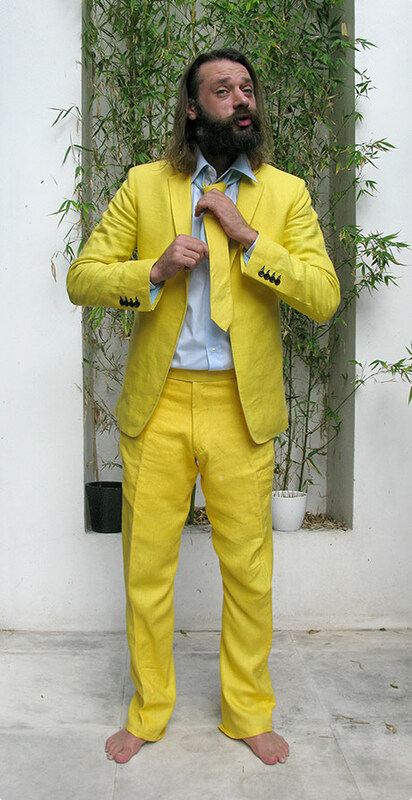 Ideally I would of like an orange suit, but I was quite taken by this bright yellow one. One of the wedding’s is my mate El, who I do all the branding for. I think it’ll be quite funny that I’ll be on brand at the wedding! I got a bit carried away with poses this morning when I got Nicky to take the picture, rest on my Flickr, I really like the jumping shot, but too gay to actually post here. Also you ladies, they’ve started a women’s line of suits (by Christy), not on the website, but I saw some down in their store. Aug 26	This entry was posted in Design, Personal, Stuff to Buy by cookie. Bookmark the permalink. Yes Irene, is has a minimal light blue lining (not much to keep you cool in the heat) and other light blue features under the collar etc. Awesome color. I especially like the slight blue hue of the shirt against the bright yellow. Does the lining of the suit match? Cheers Dil :) Should be a good night! Are you getting up on the Friday or Sat? Cooki – that is the most awesomest suit ever – I think I might feel a bit underdressed at El’s wedding next weekend, what with you in that suit and all Andy’s family in Kilts. Just got the scratchcard invitation today – brilliant work again Mr. Cook. See you next weekend in Scotland.